There is nothing more embarrassing than pet odor. Not only will it plague your entire home, but also it will encourage others to visit less often or not at all. Fortunately, there are a variety of products on the market that are capable of eliminating pet odors. However, it can be extremely difficult to find the brands that actually work in eradicating the yeast and bacteria responsible for these odors. 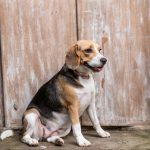 So, to help keep your shopping time to a minimum, a list of the best pet odor eliminator products is below, as well as an in-depth buying guide. 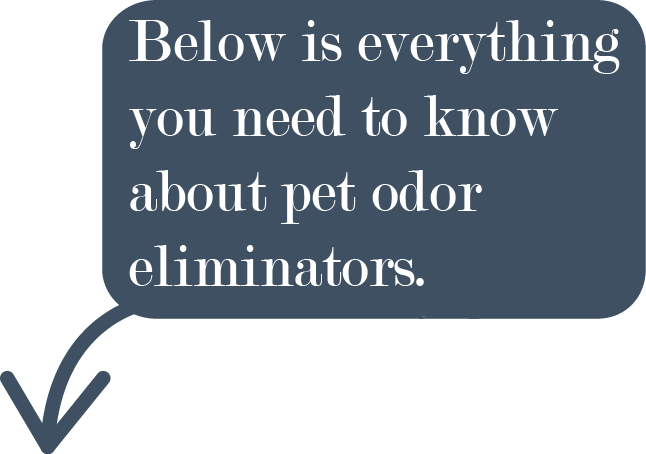 1.1 What To Look For Before Buying A Pet Odor Eliminator? 1.2 How To Use A Dog Odor Eliminator? What To Look For Before Buying A Pet Odor Eliminator? It is important to note that most odor eliminators utilize ingredients that are harmless to pets and humans. However, it is crucial to never apply these products directly to the pet’s fur or skin. Doing so could cause an allergic reaction or health problems. Utilizing them indoors and outdoors is perfectly safe, as long as they are applied properly. In the past, odor eliminators were very limited to only a few brands. Today, there is a broad range of brands, all of which utilize a unique blend of ingredients to eradicate pet odors. In addition to these ingredients, some brands also utilize special technologies that are capable of finding, trapping and destroying odors and stains. When it comes to finding the best pet odor remover, consumers need to pay close attention to these technologies. One such technology is known as Odor-Locking, which works by targeting odor and stain matter. Brands that utilize state-of-the-art technologies and specialized odor-eliminating ingredients are always going to stand out above the rest. Eliminating pet odors is not about masking the odors, it is about neutralizing the odors. Believe it or not, there are some brands that utilize scents that just cover up the odor temporarily. If the odor is still there, it will plague your home. Investing in pet odor eliminators that neutralize organic odors work more effectively than those that utilize scents to mask the odors. 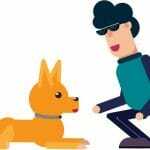 Some manufacturers utilize special agents to make the chemicals found in pet urine neutral, resulting in an overall cleaner environment. 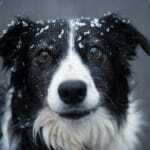 Some pets just refuse to go outside to do their business, even though they know their owners disapprove such behavior. Some pets will go so far as to hide behind furniture and other large items instead of going outside. These messes may take several days to find, since they are hidden in areas that are less frequented by humans. Once the mess is found, it has already turned into a major problem that will require extensive cleaning, which may not remove all of the stains. Pet stains are unappealing and may still produce a foul odor. This is where a high-quality pet odor eliminator will come into play. Some of these products are designed to eliminate set-in stains from all types of flooring and materials, such as concrete, grout and brick. Many manufacturers are utilizing Bio-Enzymatic agents to help consumers eliminate their pet odors and stains. These products not only eliminate conflicting pet odors, but also cleans and deodorizes. You really cannot go wrong with a pet odor remover that utilizes these unique agents. In fact, these brands will actually work quicker and better than their competitors. The Bio-Enzymatic agents will also break down stains, so they can easily be washed away. There is no doubt that cleaning up after pets can be time consuming. These chores can include anything from vacuuming to mopping. And, sometimes this is just not enough to eliminate the odors left behind by pets. While you may still need to vacuum and mop daily, utilizing pet odor eliminators that do not require rinsing can definitely make things easier. There are several brands that utilize a list of ingredients that will eliminate odors without rinsing, resulting in less time spent cleaning after pets. It really depends on the brand and required cleaning method, but spray formulas tend to be more convenient than other versions, especially those that need to be diluted with water before applying. Does Is Work On All Surfaces? Another thing you need to be concerned about when investing in pet odor eliminators is discoloration. Eliminating pet odors requires a blend of ingredients that have the tendency to stain furniture and flooring. To eliminate this risk, manufacturers spent weeks, if not months, perfecting their formulas. If staining was detected, it was back to the old drawing board for everyone involved in the process. While furniture is easy to replace, these items come with a hefty price tag. And, this is not to mention the difficulty of replacing hardwood, tile or laminate flooring. To protect your wallet, while protecting your furniture and floors from damage caused by pet odor eliminators, be sure to only consider brands that guarantee no staining. Some fabrics utilized for upholstery and clothing is very sensitive, which means even the mildest and best pet urine remover could cause damage. To eliminate these risks, it is crucial to find a brand that is guaranteed to not damage clothing or furniture, regardless of the fabric utilized. Only choose brands that are specially designed for your floors and furniture. Utilizing special ingredients for producing pleasant scents is perfectly okay, when it comes to pet odor eliminators. However, as mentioned above, these scents should not be utilized to mask the foul odors produced by pet urine and feces. There is nothing wrong with scents as long as the formula neutralizes and eliminates the odors and stains permanently. You may need to shop around a bit to find a scented pet odor remover that is suitable for your home. If you prefer, you can also go with non-scented versions. 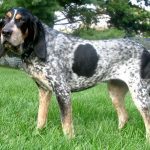 How To Use A Dog Odor Eliminator? Each dog odor eliminator is designed in a unique manner, which means each brand will require a special cleaning method to remove stains and odors. In fact, some brands require scrubbing and rinsing, while others do not require anything more than spraying the formulated substance directly to the stained surface. To receive the maximum benefits from the odor eliminator, it is best to follow the manufacturer’s instructions to a tee. If you desire convenience, be sure to only consider brands that do not require extensive cleaning and rinsing. However, some of these products may not offer the same level of effectiveness as those that require a lot of cleanup. Are you dealing with terrible pet odors that just won’t go away? If the answer is yes, you’ll definitely want to check out Emmy’s Best Powerful Pet Odor Remover. 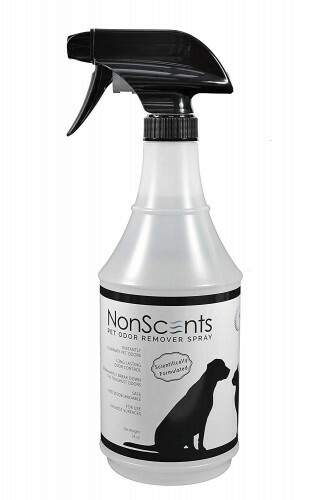 This product is specifically designed to eliminate those horrible pet odors. It is best for cleaning up urine, but it can be good for other applications too. This product will actually neutralize the smell at its source, whereas other cleaners just mask the odor. A lot of odor removing products have a very strong odor. In fact, the odor is so strong that it is going to run you out of your house or give you a migraine. These are problems that you want to avoid and that is why you should check out Emmy’s Pet Odor Remover. This product has a great smell and it isn’t too strong. The sprayer for this cleaner works great. You can just point it in the right direction and squeeze the trigger. It is really that easy. Using other cleaners will be much more difficult. 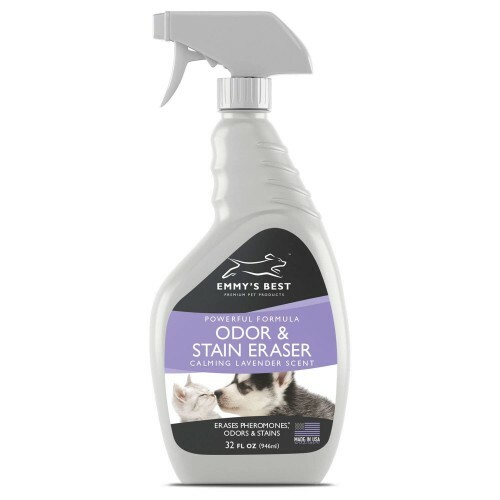 If you want a convenient and definite solution, you’ll most certainly want to check out Emmy’s Pet Odor Remover. Buying any odor remover can be risky. After all, you won’t know whether it is going to work until you’ve tried it. This is one of the main perks of buying Emmy’s Pet Odor Remover. The company is confident that you’re going to be satisfied with the results. This is why they protect the buyer with a 100% satisfaction guarantee. Even if you’ve used the entire bottle, the company will give you a full refund. Emmy’s Pet Odor Remover is great. Once you’ve used it to clean up the mess, you won’t have to put up with the urine odor anymore. There are plenty of great odor removers out there and this one from Aubrey & Alex is definitely near the top of the list. There is a great deal to like about this one. It is completely easy to use and it won’t break the bank. Even more importantly, it is definitely going to get rid of those terrible odors. Whether you’re dealing with urine or feces, you can guarantee that this product will do the trick. First and foremost, you should realize that this is one of the easiest products to use. You just point the nozzle and squeeze the trigger. Do that and the odor will be gone before you know it. You don’t have to mix anything and that will make your job significantly easier. 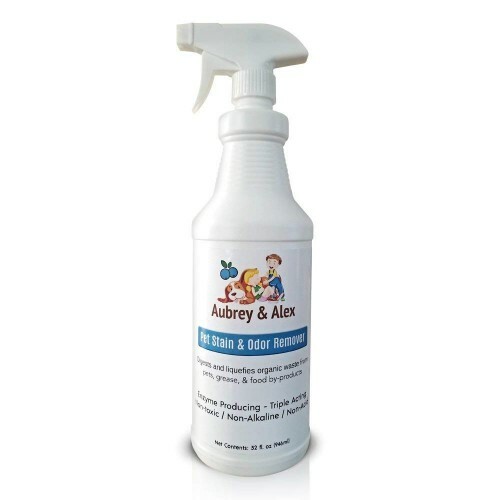 The Pet Stain and Odor Remover from Aubrey & Alex is great. It is moderately priced and it’ll definitely get rid of the odor. The only downside is that some people may not like its smell. Other than that, it is great. Wouldn’t it be nice to be able to eliminate odors and stains simultaneously? If this is what you’re trying to achieve, you’ll definitely want to check out Rocco & Roxie Professional Odor Remover. This product is designed to accomplish both tasks at once. It is suitable for the removal of dog and cat urine. Plus, you’ll have no trouble using this stain remover. Just spray the liquid in the correct spot and the odor will be eliminated before you know it. This product is very effective for eliminating stains, odors and residue. This is something that a lot of cleaning products cannot do. This one is really versatile and capable of doing it all. For the price, it is definitely well worth the investment. You’ll also be happy to know that this product is completely safe. It is free of chlorine and it will not change the colors of fabrics. More importantly, the product is safe around children and pets. The Rocco & Roxie Cleaner works great. It is moderately priced and it’ll definitely get rid of the odor. Just be cautious and don’t use too much. If you do, the cinnamon odor might be overwhelming. Are you dealing with horrible odors caused by your pets? If so, you may be able to find a suitable solution in NonScents. This odor remover is designed to get rid of the smell, while also making your life so much easier. After all, it is much easier to use than many of the alternatives. On top of that, it works better than baking soda and enzymes. It is also inexpensive. This could be the best odor eliminator for you. So, what makes this one of the best odor eliminator products on the market? Well, one big perk is the fact that it is so easy to use. When you buy this cleaner, you won’t have to worry about mixing anything. You can just use the spray bottle to target the odor. You’ll find that this pet odor neutralizer is much more convenient than the alternatives. While this pet odor remove definitely works, it is actually scent free. When using this cleaner, you won’t have to worry about getting a headache due to the overwhelming smell. This makes the cleaner the best dog urine odor eliminator for people who cannot tolerate strong smells. Despite the lack of scent, this spray actually works! NonScents works great for most occasions. However, you should know that it may not get rid of the smell of dog urine in carpets. Be sure to experiment with the product yourself to see whether or not it works for you. In all likelihood, it will. There is no doubt that your pet can smell horrible. When you begin noticing the odor, you’ll want to take steps to get rid of it. This is where Angry Orange Pet Odor Eliminator enters the picture. It might be a little expensive, but it’ll prove to be well worth it in the long run. This odor neutralizer is capable of treating the smell at its source and getting rid of it for good. A single bottle can make 4 32-ounce bottles or 1 gallon of cleaner. You just never know whether or not a product is going to work for you. You might have a super smelly dog and its odor might be too much. With that being said, you should definitely take steps to protect yourself when making any investment. This is why you’ll love Angry Orange. This odor eliminator comes with a 100% money back guarantee. If you’re not happy with the product, you just need to contact the company and get your money back. Some cleaning products are only suitable for use on carpets. Others are great outside in the yard. This is another major perk of Angry Orange. With this odor eliminator, you can literally use it anywhere and everywhere. It can be used inside and outside. It is versatile enough to get rid of the odor no matter where it is. Another great thing about Angry Orange is the fact that it is a commercial grade cleaner. This product was originally designed for industrial applications. For instance, it was used for farms and even sludge ponds. It worked exceptionally well for those situations and it’ll work great in your home too! Angry Orange definitely works. Just make sure that you do not spray too much. If you do, there is a good chance that the odor is going to be overwhelming.